The times are a-changin'. Soooo many couples these days are opting to do a first look instead of waiting until they walk down the aisle to see each other for the first time. Keep reading to learn 5 reasons why couples choose to do a first look on their wedding day! Seeing your significant other for the first time walking down the aisle is a long-time wedding tradition. In theory, it's great! But there are only a few seconds to enjoy that moment before the officiant starts the ceremony. That moment that is super emotional and impacting is actually pretty brief. There's hardly any time to really look at each other and take it all in. By having a first look, you actually get time to see each other and take in each other's love for a few minutes before you walk down the aisle and tie the knot. You get time to happy-cry with each other and say a few more "I Love You"'s. You get time to make the moment yours. Sometimes, people get nervous being emotional in front of a crowd. They can't let their true emotions pour out knowing literally everyone is staring at them. I'm like this, so I can relate. I HATE speaking in front of crowds. I always have to take off my glasses so everyone is a fuzzy mess and I can't see if anyone is looking at me. One time I even broke out in hives. ANWAY, I feel this on a personal level. If you're like me and you get stage fright, a first look is probably something you should consider. It's a private moment, away from the crowds, before any of the excitement starts. Just you two (and your photographer and videographer). You can cry if you want, you can laugh if you want, you can scream with excitement if you want. You can let your emotions flow! I'd say only about 35% of weddings that I have shot have ACTUALLY gone according to the timeline. Usually, hair and makeup runs a little late, then putting on the dress takes longer than expected, then someone can't find their left shoe...the list goes on. I mean it's fine, the wedding literally can't start without you, but all of those extra minutes cut into the rest of timeline, which means we have to cram bridal party photos, family photos (both sides! ), and photos with just you two into a fraction of the time we originally had. Adding in a First Look changes alllll of that. We'll have time to get bridal party photos and some great shots of just you two before the ceremony, so all we have to do after the ceremony are family photos and a few big group shots! Easy peasy. It leaves so much more time for photos of the two of you and time to relax before the real party starts. With all the extra time we'll have by doing a First Look before the ceremony, we'll be able to get a TON more photos of the two of you. We can go somewhere cool that we probably wouldn't have time for after the ceremony, or we can just take the time to explore around the venue and have fun! Some couples think that if they see each other before the ceremony, the moment won't be the same. How I see it? If the emotion is there, it'll happen - regardless of if you do a First Look or not. They'll be just as emotional and happy to see you the second time as they were the first time. Except now, the shock factor will be gone and replaced with the so-in-love factor, which I think is even better. I hope this helped clear up the air around First Looks! 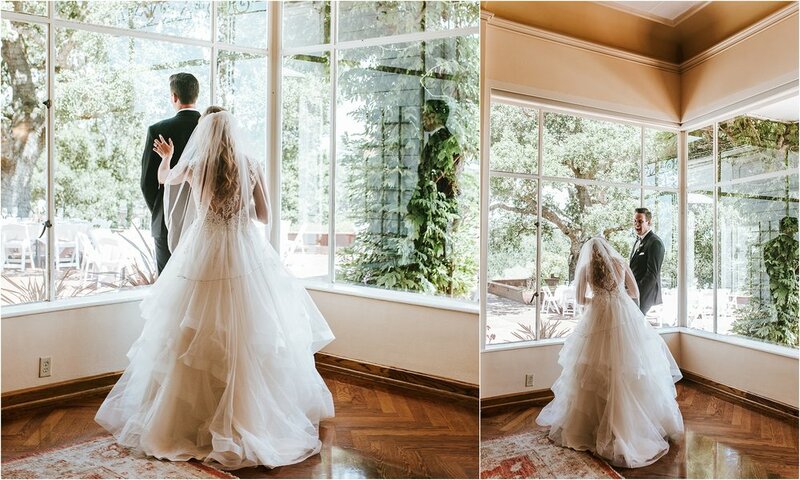 Doing a first look at your wedding a great way to savor the moment and create a memory you can look back on and truly feel for so many years to come. Still have questions? Drop me a line and let's chat! Woooo! I'll get back to ya ASAP!